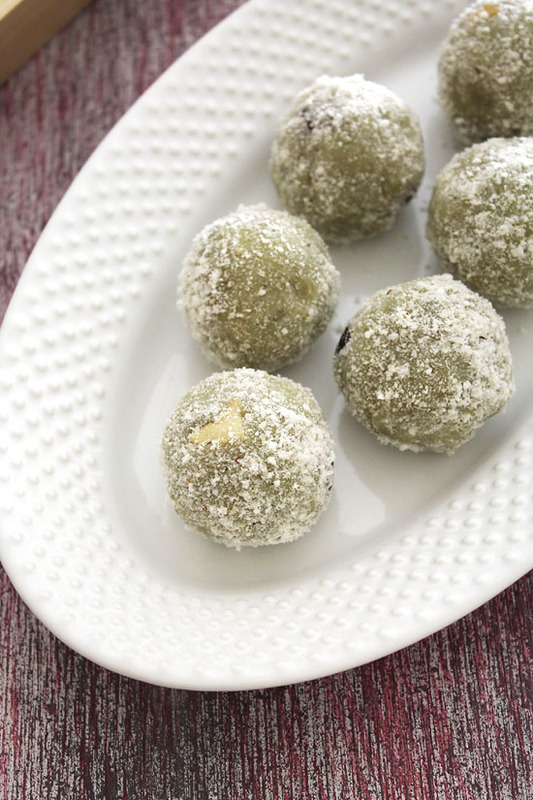 Sweet potato ladoo recipe – Healthy dessert recipe for Navratri vrat or any other religious fasting. Sweet potatoes are known as shakkarkand in Hindi, so this is called shakkarkand ke laddu. During the vrat or upavas, many times you may feel low in energy. 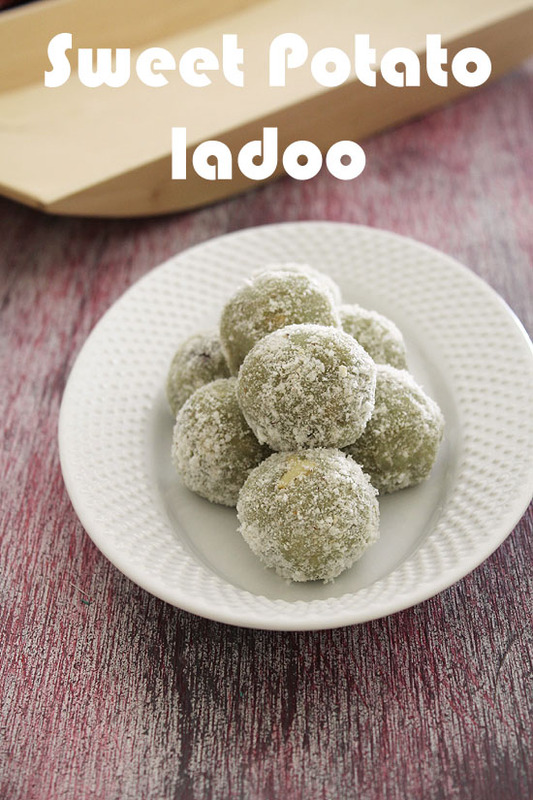 That time have this ladoo, this will make you full for some time and also gives you enough energy to do the household works. I usually eat this in the mornings. After sharing sabudana salad recipe, this is one more recipe from my mom. She get this one too from her small booklet. I usually like to eat the boiled/steamed sweet potato as such during the vrat. But hubby does not like that. So I usually make sweet potato chaat for him. And sometimes make sweet potato halwa or kheer. But this ladoo recipe, I made yesterday for the first time. The taste of it is similar to the halwa. But I find it more convenient to eat, just grab one piece and eat it. The makhana powder coated to it makes it little more healthier. To check more details about makhana, see my makhana kheer recipe. PREP: First boil the sweet potatoes in pressure cooker till it gets soft. Instead you can steam it as well. Once cool to touch, peel the skin and discard. Then mash till it is smooth. 1) Heat 1 teaspoon of ghee in a pan on medium heat. Once hot add makhana and roast for 2-3 minutes or till they are crispy and change the color slightly. 2) Them remove it to a plate or bowl and keep it aside to cool. 3) Heat the remaining ghee in the same pan. Now add cashews and roast till they are light brown in color. Then drain the excess ghee and remove it to a bowl. 4) Now add raisins and roast till they are plump. 5) Drain the ghee and remove it to the same bowl. 6) Now makhana should be cool, make fine powder into the grinder. You can do this step later too while the ladoo mixture is cooling. 7) Now again heat the remaining ghee and add mashed sweet potato. 8) Mix and cook for 2-3 minutes. 9) Now add sugar and rose water. 10) Mix well as sugar melts it will become loose. 11) Continue stirring and cooking till the mixture gets thick and there is no more moisture. 12) Remove it to a plate and let it cool to touch. 13) Once cooled, add fried cashews and raisins. 14) Mix well using hands. 15) Now grease your palm and start shaping the ladoos. I get 8 medium sized ladoos. 16) Now add the ladoo into the makhana powder. 17) Roll into it to coat from all the sides. 18) Similarly prepare all the ladoos this way. For a variation, you can use desiccated coconut instead of makhana powder. Serving suggestion: During the fasting or vrat, you can have it any time of the day whenever you are feeling hungry. Sweet potato ladoo recipe – Healthy dessert recipe for Navratri vrat or any other religious fasting. First boil the sweet potatoes in pressure cooker till it gets soft. Instead you can steam it as well. Once cool to touch, peel the skin and discard. Then mash till it is smooth. Heat 1 teaspoon of ghee in a pan on medium heat. Once hot add makhana and roast for 2-3 minutes or till they are crispy and change the color slightly. Them remove it to a plate or bowl and keep it aside to cool. Now add cashews and roast till they are light brown in color. Then drain the excess ghee and remove it to a bowl. Now add raisins and roast till they are plump. Drain the ghee and remove it to the same bowl. Now makhana should be cool, make fine powder into the grinder. Now again heat the remaining ghee and add mashed sweet potato. Now add sugar and rose water. Mix well as sugar melts it will become loose. Continue stirring and cooking till the mixture gets thick and there is no more moisture. Once cooled, add fried cashews and raisins. Mix well using hands. Now grease your palm and start shaping the ladoos. Now add the ladoo into the makhana powder. Roll into it to coat from all the sides. Similarly prepare all the ladoos this way. how can i substitute sugar in this recipe? If your sweet potatoes are sweet enough, you can skip the addition of sugar. Instead of sugar you can add jaggery or other sweeteners like stevia (If that you eat during vrat). 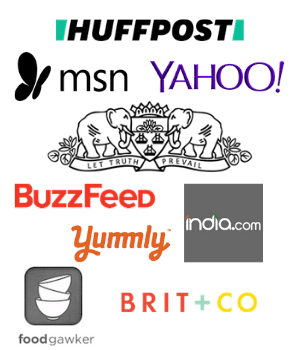 Thanks Kanan, I would try jaggery… i don’t prefer stevia any time… thanks for the response..